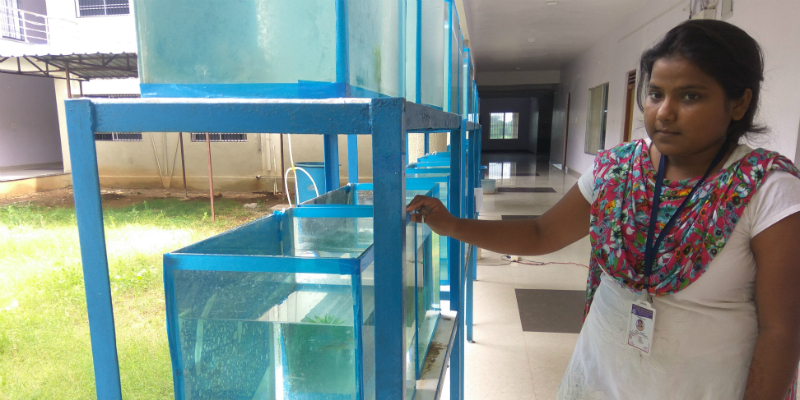 Ragini Choudhury is a second-year student of BFSC in the only Fisheries College in Kabirdham in the state of Chhattisgarh. Ragini wants to be an entrepreneur, and wants to run a business in the field of fish farming and related work. That is why she has come to study in the only Fisheries College to fulfill her dream. Ragini believes that there are immense possibilities in this field. She explains that she learned the basics in her first year; how fisheries are important for a common farmer and how to help farmers use it and eventually become financially strong. This student explains that if one area is fully utilized in the direction of fishery, it has the capacity to give a profit 10 times compared to other crops. Ragini feels that her grandfather, who is a farmer, can increase his income with the knowledge from the fisheries course. She says that when they conduct seminars in their college, the farmers working in the field of fishing visit their college from the surrounding and faraway places and learn from them. This institute is not only working towards building the future of the children of the country, but has also opened the way to increase the income of the farmers by making them learn fish farming. Chhattisgarh Government established the only Fisheries College in Kawardha. Now a fully functional building worth crores of rupees has also been built there. They have built hi-tech libraries, labs and have also started research programs there. It offers a 4-year degree course, and so far 5 batches have passed out from it. The students graduating from the college are working in different positions in Fisheries Inspectorate and Fisheries Department at various locations in the state. Also, vocational training courses and master's degree courses are also being run. So far, training of 40 farmers has been conducted in the 35 training programs. They are trained on advanced fishing techniques, how to produce seeds, processing techniques and market related information are also given so that these fishermen can strengthen their economic status. Farmers not only got trained from the Fisheries College, but they also learnt about advanced seeds. They did not know where they could find the seeds from and the seeds that they were getting weren’t growing properly. Fishermen used to bring seeds and put them in the pond, and considered the work done. Every 6 to 8 months, the fishermen used to go out there with their nets, get as many fish as they could and sell all of it. Now after training, they are feeding the fish with the right food and are preventing them from any diseases. This is also helping them grow bigger fish. The Chhattisgarh government is continuously promoting the production of fish. It needs to be understood that in 2003-04, where there were 33 hatcheries and 27 fisheries, which produced 36.78 crore fries, now it has increased to 69 hatcheries and 60 fields by the year 2016-17 and via 478.35 hectares promotional area, the state is ranked at 6th position in the country by producing a total of 197 million standard fries.